On April 28, 1192, the Hashshashin (Assassins) assassinated Conrad of Montferrat (Conrad I), King of Jerusalem, in Tyre, just two days after his title to the throne was confirmed by election. The incident was one of many bizarre and violent episodes to occur during the Crusades. These wars rank among the longest religious conflicts in human history. This article presents a timeline of some of the most bizarre incidents to occur in the roughly two hundred year long conflict between Christians and Muslims for control of the Holy Land. In late April 637, Jerusalem was officially surrendered by the Christian Patriarch of Jerusalem (St. Sophronius) to the Muslim Caliph Umar (r. 634–644), thereby solidifying Arab control over Palestine, control which would not again be threatened until the First Crusade in the late 11th century. 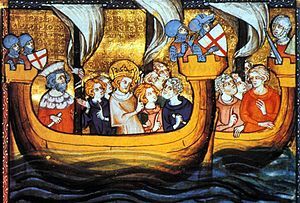 On November 27, 1095, Pope Urban II’s speech at the Council of Clermont included the call to arms that would result in the First Crusade. On May 18, 1096, Christians in Europe heeded the call of Pope Urban II and joined up with the throngs following local noblemen in a Crusade to regain the Holy Land of Jerusalem from the Muslims that occupied what is now Israel and the Levant, but on this day the Crusading zeal went in a horribly different direction. On October 21, 1096, a Seljuk Turk army led by Sultan Kilij Arslan I massacred a Christian army from Europe, known as the People’s Army, ending the first of the religious wars known as the Crusades. On December 12, 1098, in what is now Syria, Crusaders massacred 20,000 Muslims and ate some of them! On July 15, 1099, during the First Crusade, Christian soldiers took the Church of the Holy Sepulchre in Jerusalem after the final assault of a difficult siege. On February 15, 1113, the reigning Pope of the Catholic Church, Pope Paschal II, issued a Papal Bull titled “Pie Postulatio Voluntatis,” recognizing the Order of Hospitallers, a military order of Catholic knights that had existed in the Holy Land since about 1099. On October 11, 1138, the city that would one day become the most populous city in modern Syria, Aleppo, was hit with a catastrophic earthquake. Edessa, seen here on the right of this map (c. 1140), was captured by the Zengids. This disaster was the primary cause of the Second Crusade, which resulted in a decisive Muslim victory. On May 22, 1176, The Hashshashin (Assassins) made an attempt on the life of Saladin, the First Sultan of Egypt and Syria. On September 20, 1187, the Islamic forces of the famous Kurdish Muslim leader Saladin laid siege to the capital of the Christian Kingdom of Jerusalem, the holiest city in the Christian world and likewise in the Jewish world, and the third holiest city in Islam. On October 2, 1187, one of history’s most significant sieges ended, The Siege of Jerusalem in which Sultan Saladin of Egypt and Syria (r. 1174–1193) captured Jerusalem after 88 years of Crusader rule. On July 27, 1189, Friedrich Barbarossa (also known as Frederick), the Holy Roman Emperor, arrived at the capital of the Serbian King Stefan Nemanja, a city called Nis. On July 4, 1190, King Richard of England (r. 1189–1199) and King Philip II of France (r. 1180–1223) met in France at Vézelay and set out together as far as Lyon where they parted after agreeing to meet in Sicily; Richard with his retinue, said to number 800, marched to Marseille and Philip to Genoa. King Richard the Lionheart of England marches towards Jerusalem in 1191. On April 28, 1192, the Hashshashin (Assassins) assassinated Conrad of Montferrat (Conrad I), King of Jerusalem, in Tyre, only two days after his title to the throne was confirmed by election. On November 10, 1202, despite letters from Pope Innocent III (a much more popular pope than Guilty III) forbidding it and threatening excommunication, Catholic crusaders on the Fourth Crusade began a siege of the Catholic city of Zara (now Zadar, Croatia). 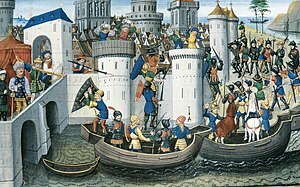 On April 12, 1204, the Crusaders’ conquest of Constantinople marked the culmination of the Fourth Crusade. On August 25, 1218, despite resistance from the unprepared sultan Al-Adil of Egypt, the tower outside the city of Damietta, Egypt was taken by crusaders. Frisian crusaders confront the Tower of Damietta, Egypt in 1218. On February 18, 1229, a treaty resulted from the diplomatic maneuvering of Holy Roman Emperor Frederick II (r. 1220–1250), which allowed the Kingdom of Jerusalem to regain some control over Jerusalem for much of the ensuing fifteen years (1229–39, 1241–44) as well as over other areas of the Holy Land. Holy Roman Emperor Frederick II (left) meets Sultan al-Kamil of Egypt (right). On April 6, 1250, The Battle of Fariskur, the last major battle of the Seventh Crusade, resulted in the complete defeat of the crusader army and the capture of King Louis IX of France (r. 1226–1270). On June 19, 1269, the King of France, Louis IX, ordered that any Jew found in any public place not wearing the obligatory yellow badge would be fined 10 livres of silver. On August 25, 1270, Louis IX died, in penitence, on a bed of ashes during the siege of Tunis in North Africa. On May 9, 1271, English Prince Edward arrived at Acre with a small but not insignificant contingent of no more than 1,000 men, including 225 knights. On September 24, 1272, Edward left Acre for Sicily and, while recuperating on the island, he first received news of the death of his son John, and then a few months later news of the death of his father. On May 18, 1291, the Fall of Acre resulted in the loss of the Crusader-controlled city of Acre to the Mamluks after being in the hands of the Franks for 100 years. Oldenbourg, Zoé. The Crusades. Pantheon Books, 1966. Next Article April 28, 1988: Stewardess Sucked Out of Jet Airliner in Flight!